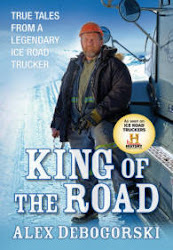 Alex Debogorski 2010 King of the Road Book Tour: "King of the Road" book tour kicking off today! Alex Debogorski, King of the Road Book Tour! We will be keeping you posted from the road so be sure to keep up with us! Check back to see photos, videos, and comments that will be updated daily! Today's kick off is being held in Two Rivers, WI starting at 4pm...it's open to the public so stop on by and wish Alex luck!